We provide Brick Game Pro 19.3.0 APK file for Android 4.1+ and up. Brick Game Pro is a free Arcade game. It's easy to download and install to your mobile phone. Please be aware that ApkPlz only share the original and free pure apk installer for Brick Game Pro 19.3.0 APK without any modifications. All the apps & games here are for home or personal use only. If any apk download infringes your copyright, please contact us. 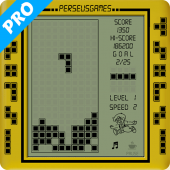 Brick Game Pro is the property and trademark from the developer PerseusGames. Brick Game Pro - another version of Brick Game with No Advertising.